Kian Reynolds Kicks through Injury to Golden Success! 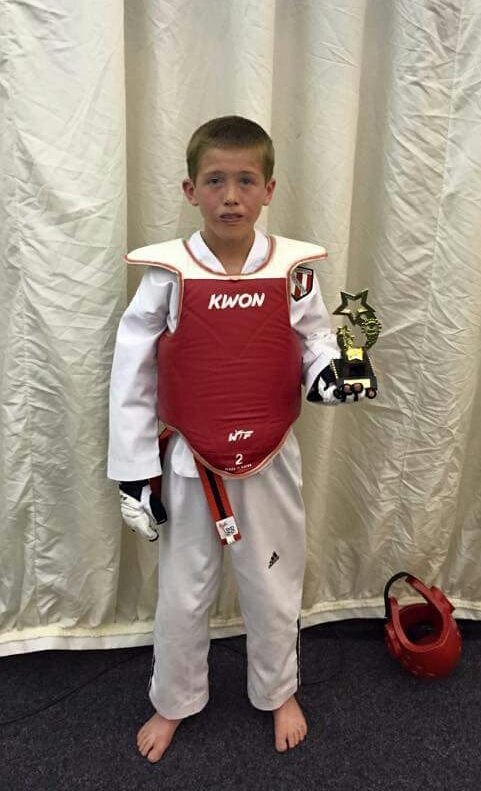 11-year-old Kian Reynolds has been training with Scorpion Taekwondo for the last four and a half years. He currently trains twice a week, putting in extra sessions at weekend. Kicking his way to competition, Kian was unfortunately set back by an injury, as he broke his arm playing football in February 2014. Not to be stopped for long, Kian was on the mats competing by June the same year. Since, the Taekwondo-enthusiast has attended many 1-2-1 & Open Competitions, winning Gold in July at the -34kg Advanced at the All Stars Open in Doncaster. On a roll, Kian followed it up with a Bronze at the recent Liverpool Open. Currently working towards his Black Belt, Kian is also training hard for the Nationals in September, and is also set to compete in his first international competition in Germany. We would like to congratulate Kian for his hard work and improvement, and wish him the best of luck in all upcoming competitions… and getting his selfie!